Mera Peak expedition offers you the trek to the summit of Mera Peak with an altitude of (6,461m). As a matter of fact, Mera peak climbing is the highest peak trekking in Nepal. You’ll ascend Mera Peak preferably during the spring and autumn seasons. These to seasons are the best time to climb the mountain for its astonishing views of the Himalayan Vista. Not only this, these two seasons are almost best for every Himalayan trekking in Nepal. From the Mera peak summit, you can have a gorgeous view of five peaks With the height more than 8,000m Everest(8848m), Lhotse(8516m), Cho Oyu(8201m), Makalu(8463m) and Kanchenjunga(8586m). Mera peak climbing can be done apparently to three different summits; Mera peak north (6476 m), Mera Peak central (6461m) and Mera Peak south (6064m). In general, most of the expedition to Mera Peak is conducted through central even though the Mera Peak North (6476m) is the highest one. Due to huge crevasses and glacial changes which occurs frequently in the Mera Peak north, you’ll have to prepare it as demanding expedition. The highly experienced, well equipped, insured mountain madness crew will always make sure that the expedition is accomplished comfortably in an amazing way. Mera peak climbing is really a demanding expedition in the Himalayas. The major factors that Make Mera peak climbing the toughest one are Mera peak expedition length, altitude gain during the climb and unpredictable weather condition. It would take a minimum of around 17 days to do this expedition. Likewise, the highest altitude after the successful climb will be about 6000 meters. Additionally, the unpredictable weather makes this climb to be a scary one. So, an adequate amount of climbing expertise and physical fitness is advised. Speedy Nepal’s Mera peak climbing team will always take good care of you. Our cook will serve you with fresh food in the camp. Likewise, Sherpas will help with the Camp setup and climbing guidance. Our expedition team will take adequate amount of Medicines, Oxygen cylinder and a Satellite phone in case of some emergencies. Your safety will be our major importance during the expedition. The month of May and October are the best time for Mera peak climbing. However, this expedition can be done in late April to May. Likewise, it can be done in late September to October. Choose Speedy Nepal for your best climbing experience on Mera peak climbing. Speedy Nepal’s Mera peak climbing cost is affordable and really efficient for all we offer. Feel free to book your expedition trip with us today. In addition to that our Mera peak climbing itinerary is prepared in such a way that it never compromises your safety during the trek. The ample distance coated between daily itineraries, the steady gain of altitude and separate rest days ensures that we have a tendency to properly acclimatize to totally relish our expedition to the Mera peak. 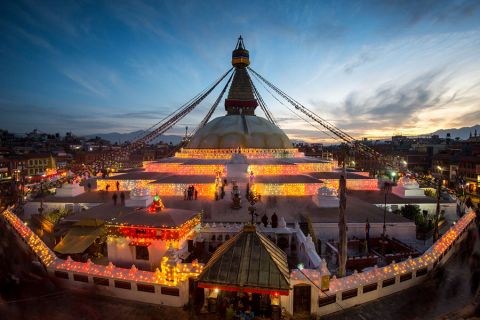 Today just after your breakfast is over, you’ll begin a guided tour to many of the most historical and religious attractions around Kathmandu valley, which also are listed as United Nations World Heritage sites. You’ll visit the historic Durbar Square, the sacred Hindu temple of Pashupatinath, the famous 'Monkey Temple' (Swayambhunath) and Buddhist shrine (Bouddhanath), which is also one of the largest stupas in the world. At noon, you’ll get your equipment checked by our climbing leader, get introduced to fellow participants, and discuss Mera peak climbing details at our office. Overnight in Kathmandu. Today, you’ll catch an early morning flight to Lukla. Right after that, you’ll start your trek to Paiya after landing at the Tenzing-Hillary airport in Lukla. You’ll walk on a jungle trail, cross a bridge over the Handi Khola and reach Surke Village. Then, from Surke you’ll tend to continue moving south and cross the Chutok La pass before reaching the little settlement of Paiyan, additionally called Chutok. Overnight in Paiya. Today from Paiya, you’ll descend for a while and reach a small bridge. After crossing the bridge the path start to get slippery until you cross the Kari La pass. Then, you’ll walk through rhododendron and bamboo forests on a narrow mountain trail. You’ll continue your trek to Panggom Village with most of the Sherpa community settlements. Overnight in Panggom. After breakfast, you’ll leave Panggom and cross the Panggom La pass shortly. Further, you’ll ascend and begin hiking on a steady path which finally turns north. After that, you’ll cross Peseng Kharka Khola firstly. After that, a hike for some time will take you to Peeng Kharka Danda. Finally, you’ll cross Ningsow Khola (stream) before you reach Ningsow Village. Overnight in Ningsow. From Ningsow, you’ll tend to ascend initially then descend for a while. After that, a little more ascend will take you to Ramailo Danda. Right from there you’ll have extraordinary views of Mera Peak and Salpa. After some ascend and descend you’ll finally, enter the Makalu Barun National Park. The path through Makalu Barun National Park to Chhatra Khola is Known as Pasang Lhamu trail Named after climber Pasang Lhamu. Pasang Lhamu was the first woman to climb Mount Everest. You might even come across the elusive Red Panda on the way if luck is in your favour. Overnight in Chhatra Khola. Today, from Chhatra Khola you’ll hike towards the north on the main trail to Mera Peak. Hiking through a path along Majang Khola, the trail then merges with another trail that moves alongside Hinku Khola. Your path will then moves straight ahead towards Tashing Ongma with some seasonal tea shops. You’ll continue your trek and cross the bridge over the Sanu Khola and finally reach Kothe. Overnight in Kothe. Today, you’ll hike along the ridge of the Hinku Khola. You’ll take lunch at Gondishung, the summer herders' settlement that lies in the west bank of the Hinku Drangka. Right Beyond Gondishung, you’ll pass a 200-year-old Lungsumgba Gompa where you’ll find Mera Peak scripted in rock along with its route to reach Mera. A short hike will then take you to Thaknak, which is a summer grazing area with traditional lodges and shops. Overnight in Thaknak. Today, you’ll leave Thaknak, following the lateral moraine of Dig Glacier to Dig Kharka. You’ll be able to sight the spectacular views of Charpate Himal today. After that, the path walks through moraines to the snout of the Hinku Nup and Shar glaciers. Finally, a little hike on more steeply trail will take you to Khare. The sight of the northern face of Mera Peak will be an amazing experience from Khare. Today, your trek will be shorter and you’ll get enough time to hike around Khare. You can do that after having your lunch. Overnight at Khare. You’ll have a separate day set aside solely for acclimatization and basic training just to prepare yourselves better for the Mera Peak climbing. Your climbing leader will help you polish your basic climbing techniques and demonstrate the best ways to use the climbing gears like the ice axe, harness, ascender climbing boots and crampons. The coaching will embrace learning the most effective climbing technique with the rope. Overnight in Khare. Today you’ll hike through a boulder-strewn trail on a steep path to reach the Mera Peak Base Camp. From Mera peak base camp you’ll further continue your ascend Mera La pass. Finally, you’ll reach Mera High Camp. The trek today will be along a rocky trail, which can be dangerous in case of recent snowfall, because of a number of crevasses present. You’ll hike to the top of the rock band that is marked by a large cairn. Our expedition team will set up a high camp. At the same time, you can relish with the excellent views of Mt. Everest, Makalu, Cho Oyu, Lhotse, Nuptse, Chamlang and Baruntse. Overnight at Mera High Camp. Today will be your important day for the expedition. Around 2 am in the morning you’ll wake up for breakfast. The climate will be very cold in the beginning however you’ll warm up as you hike up along the glacier and get onto a peculiar ridge. The path will get non-technical as you slowly ascend to higher elevation into the ever-thinning air. The steep slope on the path will appear on a section behind the ridge and You’ll get the view of Summit once again. Finally, after you reach the foot of the final steep summit cone, you might need to use a fixed rope if the climbing leader believes it’s required. Finally, after a few minutes climb you’ll reach the summit. You might get to see the first rays of the sun hitting the big peaks and the mountains changing the colours from white to golden. The summit offers the gorgeous view of five peaks With the height more than 8,000m Everest(8848m), Lhotse(8516m), Cho Oyu(8201m), Makalu(8463m) and Kanchenjunga(8586m). Later, you’ll descend back to the high camp where you’ll rest for a while. Finally, you’ll retrace back your steps to Khare. Overnight in Khare. This day is kept as a reserved day. You might need this day for summit if by any case you couldn’t climb the summit the previous day. This day is not needed if no such consequences take places the previous day. Today, you’ll trek from Khare to Kothe along the same trail used for your ascend previously. After reaching Kothe, you’ll get to celebrate your successful climb by trying out local delicacies and wines. Overnight in Kothe. Today, you’ll begin your trek to Thuli Kharka after breakfast. You’ll ascend up and then descend, after that, you’ll cross several tributaries of the Inkhu Khola before reaching a forked trail close to Taktho. Choosing the path on the right you’ll continue hiking. 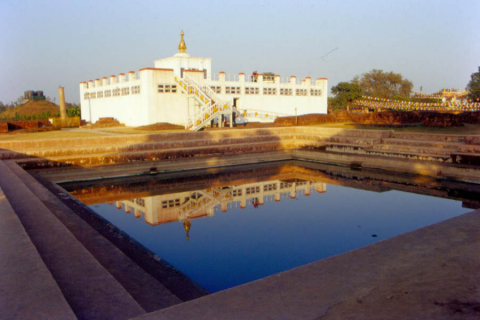 your trail then crosses through Chorten after which you’ll hike downhill on a steep trail. Next, you’ll ascend by another Chorten and reach Thuli Kharka. Overnight in Thuli Kharka. Today, you’ll cross the Zatrwa-La pass at an altitude of 4,600m. As soon as you hike through the pass, you’ll get to see the beautiful sight of Lukla Valley which is surrounded by Cho Oyu, Kongde Peak, Numbur Himal, Kusum Khangru and other Himalayan peaks. From Zatrwa La pass you’ll hike all the way down to Chutang and further to the Lukla village. In the evening you’ll relish dinner in the Himalayas of Nepal. Overnight in Lukla. 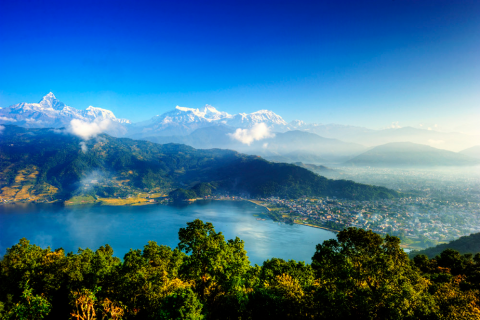 In the 14th day morning, you’ll hop a brief flight from Lukla to Kathmandu, where your journey both began and ends. You’ll be transferred to your hotel upon landing for some much-needed solo rest and reflection after your trek conquering the Himalayas. We’ll reunite in the evening for a farewell dinner at one among the most effective Nepalese restaurants in the city, where we’ll be desperate to hear your feedback on the trip.